Scientists around the globe pretty much rally to the call that yes Virginia, global warming is indeed a reality. Those of us on the side of ecology for the last thirty years have been saying a simple message: we can’t continue to dump pollutants in and on Mother Earth faster than she can naturally clean them up. And as we all know, it’s not nice to make Mothers mad. With all of the statistics, study and results-driven charts, there are still some nay-sayers that believe global warming is simply a myth. The first thing that must really be called to everyone’s attention is that the topic of global warming is not just about harming the earth and us; it’s about the business of big business. There are billions of dollars at stake in the corporate world regarding the topic of global warming and many of those dollars will go into the red if this is a reality. So before we go any further, we must always ask who the doubters are and if they have any hidden agendas. In more recent years, one of the top excuses used by those that doubt the existence of global warming is the release of some questionable scientific studies. Both the numbers submitted and the reasons the scientists took the side of such a radical supposition became the torch that was raised and in turn promoted to raise doubt about global warming altogether. A number of right wing organizations (mostly made up of engineers and big business corporate suits) have used this torch to lay waste to anyone that brings the topic of global warming up. A second and more prevalent selection of reasoning behind the ‘global warming isn’t real’ stand is contained in the natural changes that occur on the earth. Scientists have pulled ice from the deepest areas of the poles to show a real ebb and flow of climate change that does naturally occur. Those that don’t believe in global warming, point to the natural changes with an attitude of self-confidence. The only problem is, these changes usually take thousands of years to happen and they are actually happening now in a frighteningly close range. Many scientists are now quite concerned that the marketing efforts of those that don’t believe in global warming will cause a significant delay in actions needed to reverse the process. 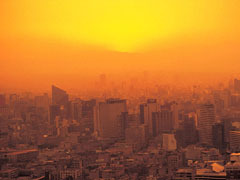 The decision of the U.S. Government as a non-participate in the Kyoto meetings on climate change carries a lot of weight. One doesn’t need a magnifying glass to figure this out, as big business seems to have its investments in high places. Meanwhile the temperature is increasing world wide. Yes, it is increasing on a minute level, but every increase in temperature has a catastrophic effect. The United Nations sponsored an individual scientific study that included eight different nations. The resulting information dictated that global warming was causing the polar caps to melt so badly and at such a quick rate that large sections of the polar caps will be completely gone by the end of this century. There may have been some convoluted studies that were indeed blended with the real facts, but it seems that there may be some hidden agendas, financially based, that have decided to risk all of our lives and the lives of future generations. Whether you believe it or not – it really just makes sense to stop the pollution. Only time will tell if we have taken it too far to reverse. Posted on November 21st under Global Warming Issues.